September 11, 2001 - We Will Never Forget! Today marked the 17th year in which we remember those who gave their lives while serving as a crew member. During the celebrations that occurred at the 9/11 Memorial Museum in New York City, the Flight 93 Memorial in Shanksville, PA and the USS Midway Memorial celebration in San Diego, CA, Flight Attendants came together with family and friends to remember not only those who were lost but also those who loved them. These events are somber events normally filled with great reverence and respect for the lives lost that day – passengers and crew alike. This year, however, the Flight Attendants who travelled to Shanksville to attend the annual Flight 93 Memorial were met with a surprise of a different type, one they will likely long remember. Arrangements were made for these Flight Attendants to travel from locations around the world from the Pittsburgh International Airport by bus to the Memorial. As we always do, today’s group arrived one hour ahead of schedule. While waiting, they learned of a Presidential stop at the event and were forced to look at messages printed on shirts that clearly indicated it was a planned campaign stop. The disrespect and mean spirited “leadership” that makes sacred ground a disgusting campaign stop is appalling. While this action delayed the arrival of our Members to the event, be assured their presence was appreciated by the family and friends of those who were lost that fateful day 17 years ago. #Never Forget has a specific meaning as it pertains to these Memorial Services. For those who were in attendance at today’s Memorial service in Shanksville it is likely they will long remember the lack of respect shown to those who died as well as all those who were in attendance at the Memorial. Flight Attendants are encouraged to review the following parameters priors to entering their October bids for the September 12 through the September 17 primary bid period. You can save your bids and come back to them at any time while the bid period is open. Remember that saving your bids does not submit them. You must use the “Submit” button to ensure your bids are on file. The absences of the “Save” button and the notification in the top right-hand corner of the Primary Line Bidding screen are indicators that your bids have been submitted. Once you submit your bids, you will receive a “Bids Submitted! !” message indicating that they are now on file. You can make changes to your bids as many times as you wish while the bid period is open and resubmit your bids by pressing the “Submit” button. However, only your last submitted bids will be considered. DO NOT click the “BACK” button or refresh your browser while you are entering your bids. These actions will result in all your unsaved work being discarded. The Primary Line Bidding screen is a separate browser window. Therefore, if you need to return to the CCS home screen, save your work and select the CCS home screen tab in your web browser. After submitting your bids, verify that the bids displayed are the bids desired. If you need to make changes, you will need to make changes and re-submit your bids. CCS will allow you to enter and submit bids that you may not be qualified for; however, those specific line bids will not be awarded during the schedule award process if you do not possess the qualification for the flying in the line. Additional information may be found in the Bidding and Awards guide located on our website. The “Opt” area allows Flight Attendants to choose between several options for monthly maximums and will apply to the type of line you are awarded. The monthly maximum for a Lineholder is 95 credited hours and for Reserves 100 credited hours. Both Lineholders and Reserves may opt to a mid-level opt, either 100 or 105 hours, respectively. The highest level of opting is over 100 hours for lineholders and over 105 hours for Reserves. While many Flight Attendants desire to opt for higher hours, maintaining 95:00 hours maximum is an option as well. If you exceed or are projected to exceed your monthly maximum, a legality code will be shown in your Master Schedule and your schedule will need to be adjusted to bring your projection down below your monthly maximum. If you are assigned a line of flying that exceeds your monthly credited maximum, you may contact Scheduling in advance of the start of the month to have your line adjusted below your monthly maximum. If you choose not to have your line adjusted prior to the start of the month, you will then be required to fly your line so long as you do not exceed your monthly maximum on an actual (block) basis (95:00 or 100:00 of block time.) If you opt for the unlimited maximum, you will be expected to fly the trips in your line. In the operation, if you are projected over your monthly actual (block) maximum hours, and dropping a pairing is necessary, your preference as to which pairing to drop will be subject to the concurrence of you and the crew scheduler. If no agreement is reached, the dropped pairing will be subject to the approval of the Crew Schedule manager. If you are scheduled over your maximum actual (block) flight time, Crew Scheduling will reassign you. IMPORTANT NOTE: Both Lineholders and Reserves may opt at any time during the schedule month at their discretion through the Electronic Bulletin Board (refer to the Trip Trades & Adjustments Guide, when available) or by calling either FAST or Crew Scheduling. For additional information, refer to the Legalities publication. 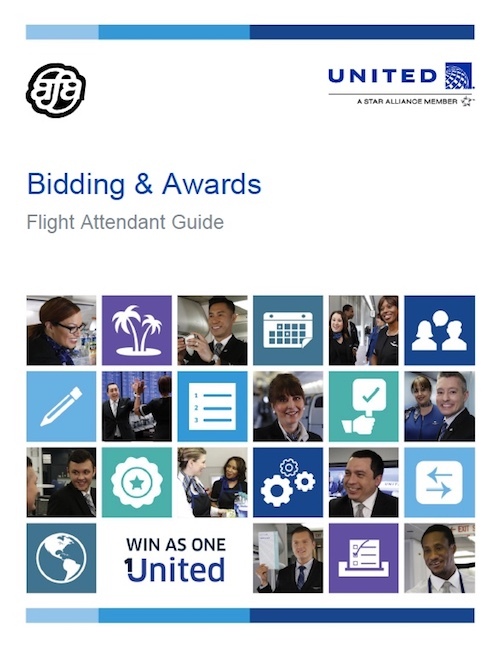 In addition to individual line bids Flight Attendants may also bid a “block bid” or submit a bid for a range of line numbers. There is no minimum, so you can block bid as few or as many lines as you want. After you enter a line number in the white box of the “Line” field, switch the toggle button, located in the “Block Bid” field from “NO to “YES”. Once switched to “Yes”, a white box will appear in the “End Line” field so you can enter the ending line number of your block bid. Note: You can block bid in ascending or descending order. Example: When bidding for all line numbers between 0123 and 0324 in ascending order with no specific position Flight Attendants first enter 0123, then 0124, then 0125, etc.) or may block bid 123 – 324. Flight Attendants may also choose to bid a Line of Flying to fly with another Flight Attendant. To place a Buddy Bid on file, both you and your buddy must indicate this on the Primary Line Bidding screen by including the buddy’s employee ID in the Buddy Bidding section. 1. Submit identical line numbers but different positions (or “Any”). 2. Submit mirrored line numbers (lines having the exact same flying but different line numbers) with different positions (or “Any”). a. An example would be an LQ Flight Attendant bidding on an LQ line that mirrors the same pairings as a non-LQ line. There will be different line numbers bid for each Flight Attendant, but the lines are “mirrored” where the pairings flown operate on the same days of the month with the exact same flying contained in the pairings. The bids of both Flight Attendants will be awarded according to the seniority of the junior Flight Attendant. IMPORTANT NOTE: Mirrored Line numbers are two different numerical lines within the bid packet that are identical (same pairing dates, segments, layovers, etc.). The only difference between the two lines are positions and pairing numbers. International Purser Flight Attendants may buddy bid with non-International Purser Flight Attendants; International Purser Flight Attendants may buddy bid with other International Purser Flight Attendants but only for Vacation Relief Lines in the Primary bid or matching Reserve Lines. LQ Flight Attendants may buddy bid with non-LQ Flight Attendants; LQ Flight Attendants may buddy bid with other LQ Flight Attendants but only for Vacation Relief Lines in the Primary bid or matching Reserve Lines. After making your selections, click the “Save” button to record your choices. You may also “Submit” at this point or wait to submit until you’ve finished the entire bidding process. Additional information on Sick Leave can be found in the Pay Guide. If you want to bid a Vacation Relief Line, you may enter “RLF” to bid all Vacation Relief Lines (Domestic and International) or you may enter a specific line number(s), or line number ranges assigned to Vacation Relief Lines. More information about Vacation Relief Lines bidding is found in Chapter 4, Section B of the Bidding and Awards guide. The 35-in-7 rule applies only to Reserve Flight Attendants and states that a Reserve may not be scheduled to exceed 35:00 flight hours in any 7 consecutive 24:00 hour periods. A Reserve may elect to waive this legality by selecting the 35-in-7 Reserve Waiver Box on the Primary Line Bidding screen during the monthly bid submission. For more information on 35-in-7 and Reserve Preferencing, please refer to the Reserve Guide. Note: Reserves may not be rescheduled to exceed 35-in-7 without their consent. If a Reserve is assigned only Domestic pairings, or a mix of both Domestic and International pairings, the 35-in-7 rule shall apply. If a Reserve is assigned only International pairings, the 35-in-7 rule shall not apply. The 35-in-7 rule only applies to actual working flight time (block time) not deadheading or credit time. The 35-in-7 rule is for schedule planning purposes only. If flight time increases during the actual operation of the pairing, the Flight Attendant must fly out the pairing, even if 35-in-7 is exceeded. Note: Any 35-in-7 legality code will appear in your Master Schedule. It is important to note there has been a change to the application of the 35-in-7 waiver as it applies to the box on the monthly bid screen for pre-merger United Flight Attendants. Whereas in the past this box applied only to the seven day period at the conjunction of the old and new month schedule, checking the box on the bid card in CCS will not indicate that you are waiving your 35-in-7 for the entire schedule month. Annual Enrollment Benefits Fairs Coming Soon. Upcoming dates and locations for annual Benefits Fairs can be found on Your Benefits Resources (YBR). Watch for additional information concerning your 2019 benefits to be released soon. As a reminder, Flight Attendants based in domiciles from which flights to/from the Peoples Republic of China are operated, including deadheading crews, will be required to have a PRC crew visa, effective as of October 1, 2018. Flight Attendants based in the following locations who are not currently in possession of the PRC crew visa are strongly encouraged to start the PRC crew visa process as soon as possible. Expense reimbursement for the cost of the visa can be processed by submitting a receipt via the Concur reporting system. Detailed information on PRC crew visa process and application can be found here.